We’d love your help. Let us know what’s wrong with this preview of Hello, Jell-O! by Victoria Belanger. Food blogger Victoria Belanger shares the secrets to creating inspired, modern gelatin desserts—with fresh fruits and flavors, new twists on trendy treats, and easy but artistic presentations. A classic, nostalgic treat is getting a makeover, thanks to innovative culinary bloggers like Victoria Belanger—aka the Jello Mold Mistress of Brooklyn—whose jiggly creations have ca Food blogger Victoria Belanger shares the secrets to creating inspired, modern gelatin desserts—with fresh fruits and flavors, new twists on trendy treats, and easy but artistic presentations. A classic, nostalgic treat is getting a makeover, thanks to innovative culinary bloggers like Victoria Belanger—aka the Jello Mold Mistress of Brooklyn—whose jiggly creations have caught the eye of food journalists, trendspotters, and a new generation of food crafters. 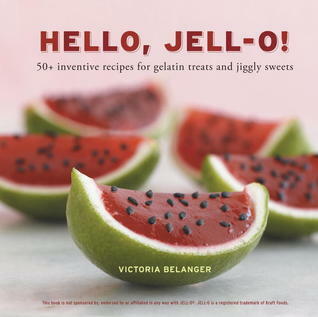 In Hello, Jell-O!, Belanger shares her secrets for turning humble gelatin into impressive yet economical desserts that will steal the show at your next party or potluck. Featuring holiday crowd-pleasers such as Pumpkin Pie and Eggnog Rum, kid-friendly favorites like Root Beer Float Squares, grownup boozy bites like Sparkling Champagne and Strawberries, and vegan delights like Watermelon Basil Agar, the Jello Mold Mistress serves up recipes for every occasion. The deliciously wiggly versions of Key Lime Pie, Chai Tea Panna Cotta, and Chocolate Peanut Butter Cups will charm the inner child in every sophisticated home cook. To ask other readers questions about Hello, Jell-O!, please sign up. Be the first to ask a question about Hello, Jell-O! Out of 50 recipes I will probably try about 4 of them. 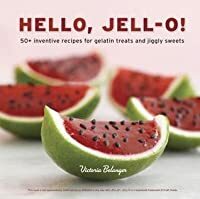 I love the looks of this little book and love the fact that it's all about jello. However, I probably won't make that many. Most of them are fairly easy looking and they all look yummy. Some look a little more time consuming than what I want to put into jello. I do however wish there were more little books like this with one easy subject. Although this book has some interesting ideas, I was disappointed to discover that most of the recipes did not have an accompanying photo. Also, it would have been better if some of the more complex recipes had step-by-step pics. Jell-o so needs to come back in style. It's not just a dessert for the infirm nor is it a weird dessert with sliced up carrots in it. I've made several of the recipes in here and they've all turned out well. So good! This was a scholastic book fair pick-up at my job, mostly because I was hilariously amused there's an "adult drinks" section. I am totally going to making some of those for future get together with some of my friends. This book has great recipes and tips for delectable gelatin delights. The easy to follow, step by step instructions have worked out wonderfully for each recipe I have tried, creating both delicious and visually appealing desserts! Best recipe was the one on the cover. Quick and easy, and definitely inspirational for possible dishes for picnics or events. I don't eat jello often and when I do it's very plain but this book had some intriguing combinations.....raspberry cosmo anyone?